Join 100 Feet Kite School for a full board kite camp in Cape Verde! Under Elvis' instruction, you will enjoy the course while having fun in a beautiful beach. 100 Feet Kite School offers quality and assistance in a unique atmosphere. Here is the place where you will have the opportunity to enjoy your holiday as a real local. The good humor, the desire to practice, this beautiful sport, the fantastic beaches, the people, and the local music will make you spend unforgettable days with no stress and with a common passion for kitesurfing. This camp will be led by Elvis, the most complete Cape-Verdian rider, trained, and experienced in the discipline of freestyle, big air, and strapless. You can learn simple tricks, new maneuvers, and ride new spots on Sal Island. You can try and ride the new 2018 collections of Woodboard and Kiteloose boards during the strapless and freestyle clinic. Elvis was born in Sal, Cape Verde, on April 25, 1986. At the age of 10, he started with windsurfing and reached a high level of riding under the guidance of legend Josh Angulo. But it was Mr. Nacho, a tourist from Tarifa, who came to Sal for a holiday that introduced him to kitesurfing. He let him try his kite which made him immediately fall in love with the sport. At the age of 16, he quit windsurfing to fully focus on kitesurfing. Since then, he has been kitesurfing. You will have breakfast, lunch, and dinner in a variety of local restaurants with water or soft drinks included during meals. 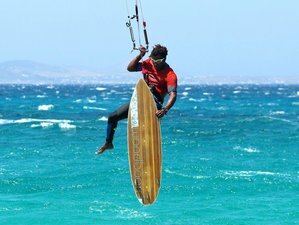 100 Feet Kite School offers you the opportunity to choose a wide range of quality services in the sports sector of kitesurfing on the island of Sal, Cape Verde.